Weather is an easy scientific phenomenon for kids to observe and discuss. Here are some hands-on ways we explored it in our STEM enrichment class for preschool and elementary age kids (3 – 6 year olds). Teach Vocabulary: Any time you look at the weather with kids, you can teach words that describe it. At first, we keep it simple, but then the more words they learn, the more specific we can get. I’ve listed some examples, in order from broad and simple to specific. Sunny or Cloudy // Mostly sunny, partly cloudy, overcast, hazy, foggy // cumulus, cirrus, etc. Drawing the Weather: Encourage kids to draw what they see. Also, show them “weather icons” which are standard ways to symbolize different types of weather. Chart the Weather: You can search online for “kids weather coloring” pages and find lots of options. Print one, and have you child color it in (or create your own) and then use it each day as you check the weather. Use a paper clip or other marking tool to mark on the chart the type of weather you observe. Cloud Observation: You can look at clouds two ways: the scientific way, and the imagination way. I like to do both!! Some days, it’s nice to just lay on your back on the grass, look at the clouds together, and imagine what you see – bunny rabbits? dragons? hearts? It’s also fun to learn the scientific names of different cloud formations, and what they tell us about what weather to expect. Cloud Identification Tool: You can create a frame on a stick which has pictures of all the types of clouds around an opening. Kids hold it up to the sky and look at the clouds through it, then identify the type of cloud they see. You can find a free printable to download on Teachers Pay Teachers, or a different one on Full of Great Ideas (she also includes directions on how to make your own.) Or, you can purchase Weather Window Science Kits on Amazon, but the one review isn’t favorable. Pinecones: A few days before class, put one pinecone in a moist location and one in a dry location. At class, show them to kids, and share information about how pinecones can help show what the weather has been / will be. Learn more about pinecone weather science here. If you have any of these weather tools , show kids how they’re used to measure the weather: Thermometer , Rain Gauge , Weather Vane , Anemometer , and wind socks. If you don’t have them, you can order one by clicking on any of the links in that previous sentence, or even better, you can make your own weather tools! Just click on that link for all the how-tos and tutorials. 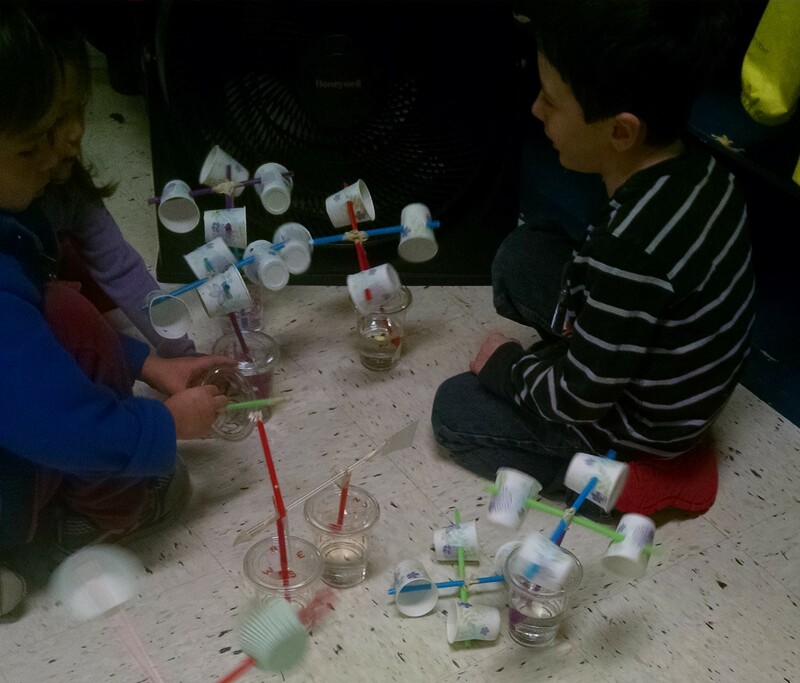 In our class, our kids made weather vanes and anemometers. The teachers made a sample thermometer and rain gauge. 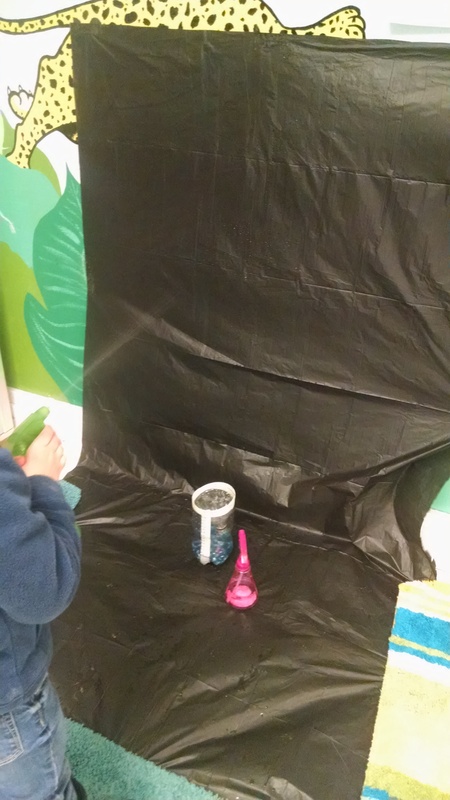 We set up a testing station, where the kids “made it rain” with spray bottles to test our rain gauge, “made the wind blow” with the fan to test the weather vanes and anemometers, and tested the thermometer in a dish of ice or wrapped in a heating pad. 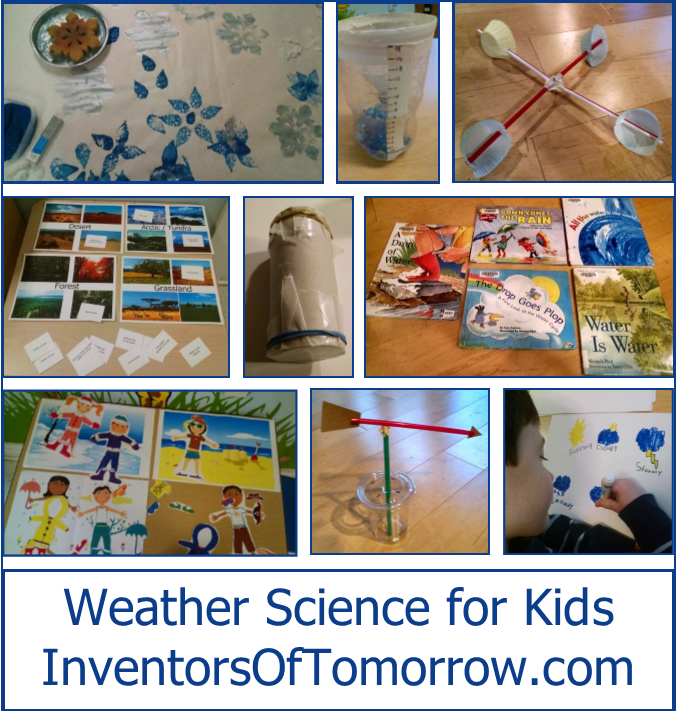 These weather activities tie into Next Generation Science Standard K-ESS2-1. “Use and share observations of local weather conditions to describe patterns over time. [.. could include descriptions of the weather (such as sunny, cloudy, rainy, and warm); … quantitative observations could include numbers of sunny, windy, and rainy days in a month… patterns could include that it is usually cooler in the morning than in the afternoon…” You could also cover K-ESS3-2, which is about weather forecasting to prepare for severe weather. We didn’t include this, as it would have been too much to cover in our two hour class. (Also, we have a couple students with some anxiety about storms.) If you are homeschooling, you may have more time flexibility. One of the key life skills kids learn is how to choose the right clothes for the weather. This theme is a perfect time to get them thinking about this question. I printed these paper dolls from education.com, and printed three “background scenes”, which showed the beach, a snowy day, and a rainy day. I laminated the paper dolls for durability. Then kids could arrange the clothes on the dolls in each of the scenes. There are also plenty of other printable matching games to match which clothes are suitable for which sorts of weather – just search online. 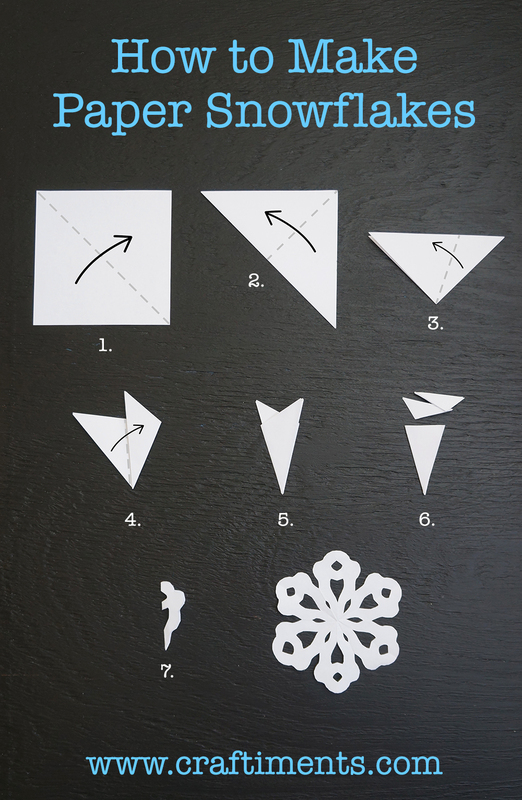 Paper Snowflakes: Put out paper from the recycling bin, scissors, and instructions on how to make paper snowflakes. (Here’s illustrated directions, and here are more details.) I knew paper snowflakes might be new to the kids in my class, but I originally thought they were something that all adults would know how to do, having done them many times in their lives, and I was surprised to discover that many of the parents in my class had never made one before. 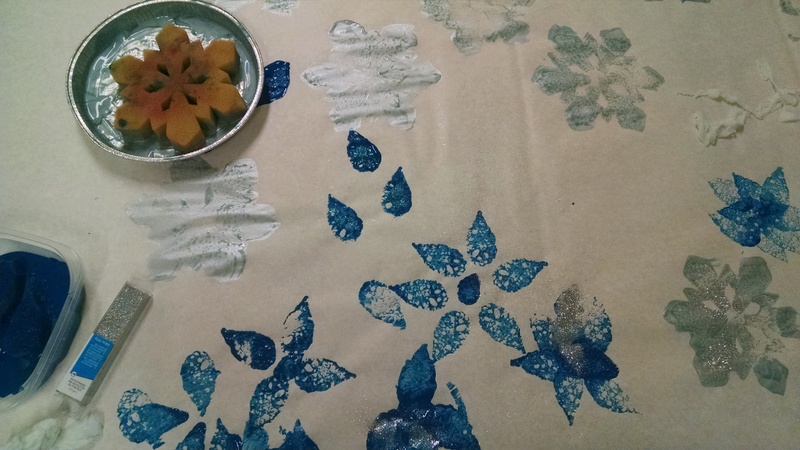 Group Artwork – Weather Prints: We had a snowflake shaped sponge which we used with a pale blue metallic paint. I cut raindrop shapes out of a sponge, and we used those to print blue raindrops. We also had glitter to sprinkle on. My intention was to also offer puffy paint for clouds – puffy paint is a mixture of shaving cream and glue – and lightning bolts cut from aluminum foil. You could also offer a sun shaped stamp or sponge with yellow paint, and paint for rainbows. (We had painted rainbows the previous week, so we didn’t include that option.) You could use these for individual art projects at the easel, but we chose to cover a big table with paper, and let all the kids work on the same project together. Rain Sticks. When you rotate these tubes, you’ll hear the rice and beans falling down through them – it sounds a bit like rain. 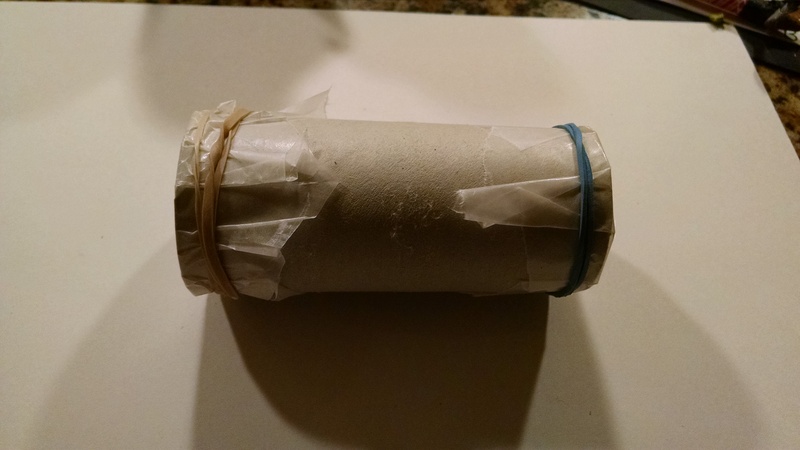 Take a paper towel tube (you can use a toilet paper tube instead, but the rain effect is not as good when the beans don’t have as far to fall). Cover one end with waxed paper, and rubber band it or tape it in place. 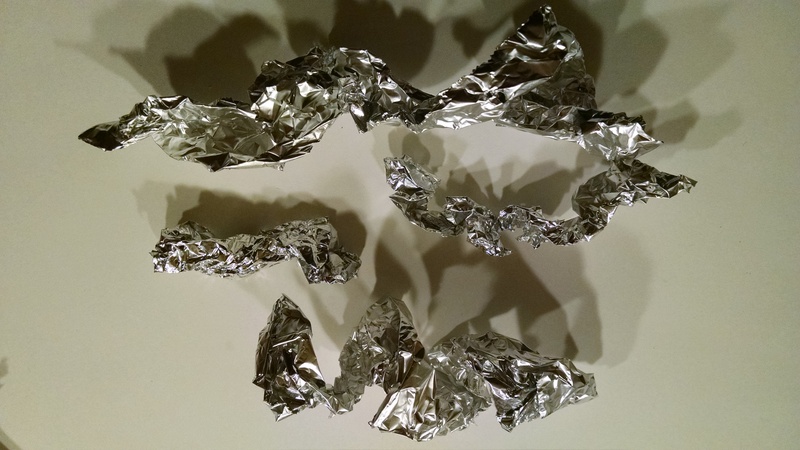 Take a few strips of aluminum foil and crumple them lightly and place them inside the tube. (It may work to roll a spiral of foil around a dowel – the screw shape works well.) The goal of the foil is to slow down the falling beans. 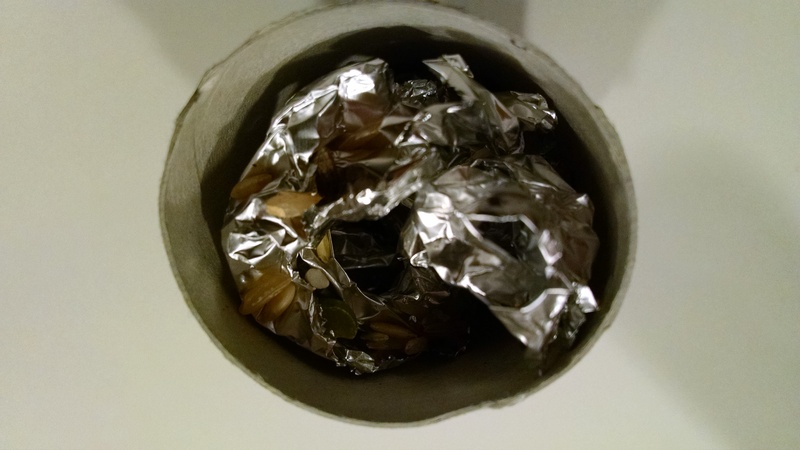 But don’t pack the tube too tightly with foil, or the beans won’t be able to pass through. (If you happen to have chicken wire, it can work well too, but be careful of all the poky ends.) Add a spoonful of dried beans and a spoonful of raw rice. Cover the other end with waxed paper. Decorate as desired. Rain Clouds in a Jar and Shaving Cream Paper Marbling. 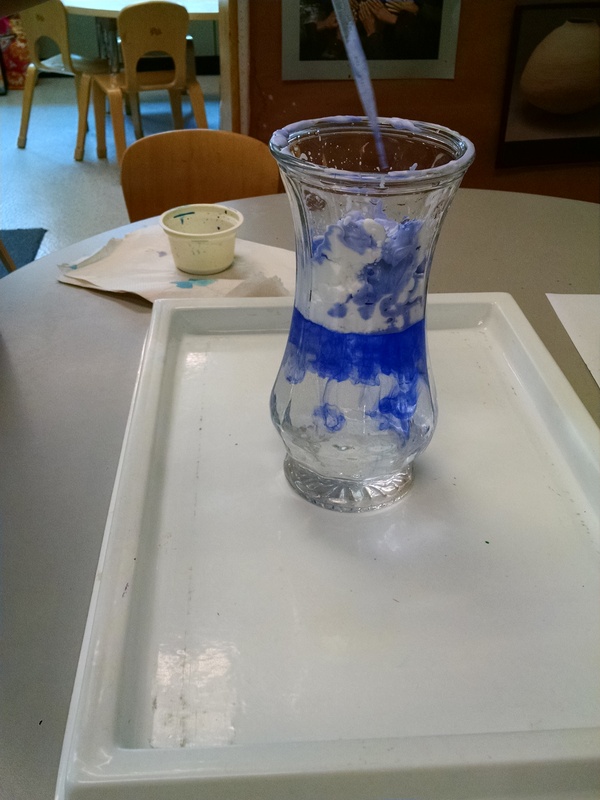 This is an art process that leads to an art project… First, fill a container with water. Then spray on a thin layer of shaving cream. Then use a pipette to drip liquid watercolors (or use food coloring) onto the shaving cream. It gradually trickles down through the shaving cream, then disperses out the bottom of the shaving cream “cloud” and into the water, looking like colorful rain falling from the clouds. (Learn more about the science ideas you can share at Steve Spangler.) When you’re done with this activity, you can do shaving cream paper marbling. Drop on more color, if desired, then swirl the shaving cream with a toothpick to make beautiful patterns. Take a piece of paper. Lay it carefully on top of the shaving cream, then press it FIRMLY into the shaving cream (but don’t press so hard you spill the water!) Then peel the paper off, and scrape all the shaving cream off the paper. Beautiful marbled patterns will be left behind. Snow Dough: This makes a “play-dough” that is very white, and smooth to the touch. This rolls into really smooth round balls, so it’s great for making little snow-men with. It doesn’t cut as nicely as some other doughs, so it’s not as good with cookie cutters. The lotion keeps it somewhat cool to the touch. If you want to make it feel more like snow, chill it in the fridge before using. Recipe: Mix together 2 cups corn starch, and 1 to 2 cups unscented white hand lotion. Knead. As with all play-doughs, you want a pliable texture that is not sticky. (If it’s sticky, add more corn starch.) Optional – a few drops of peppermint extract or peppermint essential oil, and/or glitter. Sources: Pre-K pages, and Growing a Jeweled Rose. We’ve discovered that the brand of lotion matters. The first year we did this, with some lotion from Safeway, we had GREAT results – a really nice silky playdough. The second year, we used a dollar store lotion, and it was sticking to everything and leaving lots of residue blobs wherever we worked. We tried adding more corn starch to unstick it, and then we just had powdery blobs. So, test a tiny batch before you commit to a full batch. Make It Rain Demonstration: Fill a glass jar with steaming hot water. Place a cold metal pie plate full of ice on top. Watch what happens. (Water droplets condense on the inside walls of the jar.) Learn more at Physics Central and Learn NC. Cold Fronts and Warm Fronts: When cold air masses meet warm air masses, the cold air slides underneath it. This can cause rain, thunderstorms, or tornadoes. You can demo this: Cut a piece of cardboard so that it divides a bowl in half. Pour very hot red-colored water in one half at the same time as you pour blue-colored ice water in the other half. The cardboard holds them apart as you pour. Quickly pull out the cardboard and they will combine, with a layer of blue on the bottom, purple in the middle, and red on top. Learn more at Preschool Powol Packets and Life with Moore Babies. Note: We tried this demo three times… we got condensation on the saran wrap, and a few droplets gathered, but no rain in the cup. Cloud in a Jar idea: We tried the smoke method described on Gift of Curiosity, and although it did work, the effect was subtle and would have been hard to show to a large group of kids – might work one on one. You could also test the hair spray method listed there, or at NOAA or Cool Science. Making Frost: Fill a steel can with ice. Sprinkle on salt. Frost is supposed to form on the outside of the can. I got great condensation, but no frost. Explanation: This Crash Course video on Weather vs. Climate is a nice overview of the difference. You could show the video (for kids age 5 and up) or use it as a basis for your explanation. The big ideas I would share are that weather is the short-term observable phenomenon – minute by minute changes in the atmosphere. When we observe the day’s weather, it helps us decide what clothes to wear that day, and whether we will spend much time outdoors. Climate is a long-term pattern / trend for a particular region. A biome is defined by its climate, soil type, and the plants and animals that live there. Climate helps people decide what kinds of houses to build, what crops to plant, and what animals to raise. Biomes Matching Game. I designed a free printable with pictures of four biomes, and 16 cards (4 that describe precipitation, 4 temperature cards, 4 on plant life, 4 on animal life) that children can sort out into which items are true of each biome. There’s two versions of the cards – one has pictures and words, for younger children. The other has only words, for kids with stronger reading skills. Download the biomes matching game here. Nature Hike. Go for a hike outdoors. As you walk, ask about what the typical weather is like where you live. Is it ever as cold there as it gets in the Arctic? Is it ever as hot there as it gets in the desert? Ask what kinds of plants grow there. Will cactus grow there? Bananas and pineapples? Ask what animals live in your region. Do you have polar bears? Why not? Do you have desert foxes and gila monsters? Why not? Ask what your soil is like. Do you live in a sandy desert? Is the ground permanently frozen? 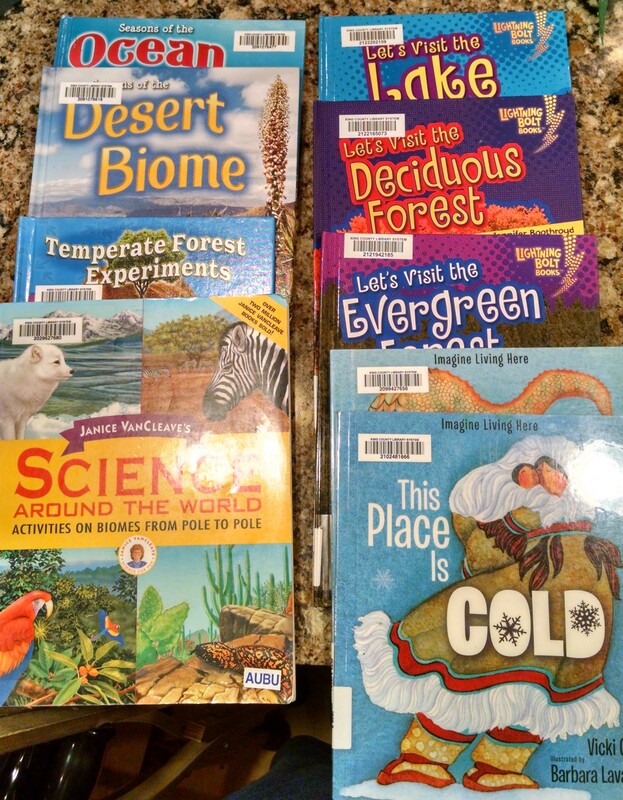 Eclectic Homeschooling has a nice collection of resources for learning more about biomes. Indoor Snowball Fight: Using a bunch of big white pompoms (or a bunch of pieces of white paper crumbled into balls, have a “snowball” fight. Puddle Jumping: Make lots of blue paper “puddles”, and have them jump from puddle to puddle. You can do this like a musical chairs game – when the music stops, if they’re not in a puddle, they lose. Or have them jump OVER the puddle without getting “wet”. Add more puddles or bigger puddles for longer jumps. 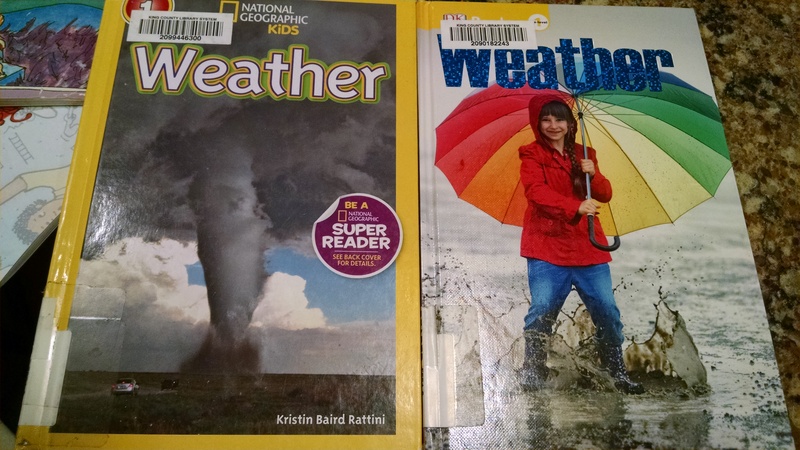 We had two equally good options for early reader non-fiction overviews of the weather. National Geographic Readers: Weather by Rattini and DK Readers: Weather. The DK book was better for 3 – 4 year olds, and the National Geo for 5 and 6 year olds. But either are fine overviews of the key points. They described the basic types of weather (rainy, snowy, sunny….) and how we make decisions about clothing and activities based on the weather that we see outside. All the Water in the World by Lyon. Poetic. Nice illustrations. “Water goes around. That same water that cascaded from clouds, meandered down mountains, wavered over waterfalls, then slipped into rivers, and opened into oceans. That rain has been here before.” Inspires a sense of how precious and timeless water is. 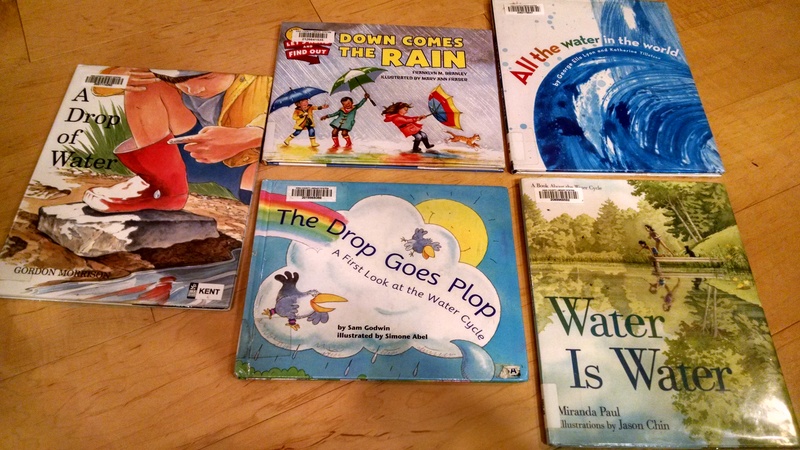 Water Is Water: A Book About the Water Cycle by Paul. Poetic, with beautiful illustrations. “Drip. Sip. Pour me a cup. Water is water, unless it heats up. Whirl. Swirl. Watch it curl by. Steam is steam unless…” Not a scientific text. Nice representation of bi-racial parents in illustrations. Did a Dinosaur Drink This Water? by Wells. Also a fun book – we use this, because the week after we study weather, we move into dinosaurs! The Snowflake: A Water Cycle Story by Waldman. A very pretty book, with nice science tie-ins about a droplet of water changing and traveling throughout a year. which is aimed at 10 – 12 year olds, but is packed with ideas for experiments and projects, so is a useful resource for teachers (or parents) who are working on science curriculum. Water Cycle Song: Sing to the tune of ‘She’ll Be Coming Round The Mountain’. Source. There are so many songs about weather it was hard to choose which to do. (Here’s one collection of options.) So, we played an Encore style game. I asked kids and parents to think of a song with the word rain in it, and start singing it and we’ll all sing along. After a while, I asked for songs about sun, and so on. We did kid songs like “Rain Rain Go Away” and “It’s Raining, It’s Pouring”, show tunes like “Singing in the Rain” and 80’s pop songs “Here Comes the Rain Again.” We did “Greased Lightning” and “Knock on Wood” (It’s like thunder! Lightning!) We did Barney songs “Mr. Sun” and Beatles songs “Here Comes the Sun.” It was quite fun.